Traveloscopy Travelblog: NOTHING FAWLTY HERE NOW BASIL’S GONE – QUE? 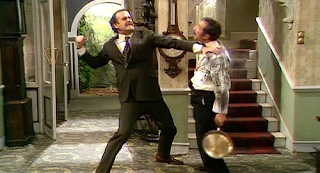 NOTHING FAWLTY HERE NOW BASIL’S GONE – QUE? THERE are no out of date kippers to kill you, and no conversations over breakfast with senile retired Army Majors or dear old things who are as deaf as posts. And the owner will neither abuse you when you ask a simple question nor, despite the fact you're watching, take physically to an English-impaired waiter from Barcelona…. Yet while you'll never have been inside this place in your life, step through the door and you'll feel you're time-warping back into history. Because this is the Hotel Gleneagles at Torquay in England's Devon, a delightful holiday bolt-hole, but forty years ago a questionable inspiration for BBC-TV's smash-hit Fawlty Towers – even though physically the hotel itself never featured in the series. But according to John Cleese who co-scripted Fawlty Towers and played its irascible and bumbling owner Basil Fawlty, he based the show on the bizarre behaviour of the owner of the Hotel Gleneagles when Cleese and the Monty Python television team stayed there while filming locally in 1971. This included him tossing the briefcase of one of the stars over the hotel fence because "it might have a bomb in it," and berating another in the dining room for not placing his knife and fork correctly after he'd finished eating. And after he threw a timetable at a guest who dared ask about a bus into town, Cleese described him as "the most wonderfully rude man I have ever met." They wrote just six episodes that aired in 1975 and after countless repeats in Britain and world-wide, in response to viewers clamouring for more, wrote a second series of six in 1979. Amongst the most popular tracked by viewer-ratings were The Hotel Inspectors, The Germans, The Kipper and the Corpse, and the final episode, Basil and the Rat. 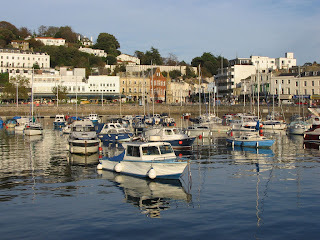 And one of the most famous lines was devised by Cleese after recalling the owner during his 1971 visit demanding of a guest who asked if there were rooms with views: "What do you expect out of a Torquay hotel window?" Cleese and Booth re-worked it as Basil berating a guest who asked the same question: "What do you expect to see out of a Torquay hotel bedroom window? The Sydney Opera House perhaps? The Hanging Gardens of Babylon? Herds of wildebeest sweeping majestically over the plains…?" The original owner sold out in 1973 and when a reporter tracked him down after Fawlty Towers first went to air, he vehemently denied being the inspiration for Cleese's Basil Fawlty. Even after his death his wife steadfastly maintained that her husband had been "seriously misrepresented." When the current owners bought it in 2006 they raised it to 4-star standard with a new pool, al fresco dining area, and luxury touches to public areas and bedrooms. And to finish, Belgian Waffles with Forest Fruit Jam and Crème Chantilly, Pear Crumble with Custard, Chocolate Torte with Crème Anglaise and Chocolate Shavings…. We just wonder what Basil would make of it all?